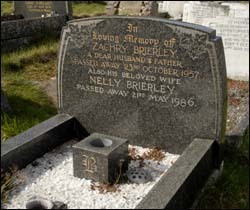 Zachry Brierley and his brother James came from a family in Rochdale which had made a fortune in the pork pie trade. The brothers bought a Llandudno-based motor coach company, for which they created a new garage on Gloddaeth Avenue in 1934. They had loftier ambitions for the air space above the garage. First they built an elevated car park, forerunner of today’s multi-storey Victoria Centre car park. In the 1930s, however, motorists had plenty of parking spaces available in the streets. The brothers then had a cinema built above the garage, but found that they couldn’t get insurance because of the risks where large numbers of people were packed into an enclosed space above a garage. So the coaches were moved elsewhere and the ground floor converted into a ballroom. The complex was billed as the Winter Gardens Theatre, Cinema and Ballroom and was Llandudno’s tallest building. For the opening night, in 1935, Zach and James booked singer Gracie Fields to deliver a message of good wishes to the audience via a telephone line and the venue’s state-of-the-art amplifiers. The cinema later became part of the Odeon chain. In 1963 the venue hosted the Beatles. Zachry died in 1957 and his wife Nellie in 1986, the year the Winter Gardens closed. You can see more information and a photo here.